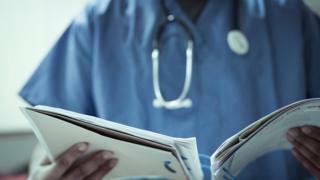 The NHS in England is to become the first healthcare system in the world to publish figures on avoidable patient deaths, the health secretary has said. By the end of 2017, some 170 out of 223 trusts will publish data on deaths they believe could have been prevented. It is estimated there are up to 9,000 deaths in hospitals each year caused by failings in NHS care. The Department for Health said it wanted to ensure the NHS learned lessons from every case. There is no standard definition of an avoidable death and each hospital trust makes its own judgment. The data released by the organisations will include details of reviews and investigations into deaths, and information on any action taken as a result. As part of the release from more than three quarters of England's trusts, families of patients will also be given full explanations over relatives' deaths. These explanations, the department says, will be used to support bereaved relatives and carers, and will ensure they are treated with empathy, compassion and respect. Out of a total of around 240,000 deaths in hospital, the government says there are between 1,200 and 9,000 deaths each year caused by problems with care. Two cases highlighted by the government are that of 18-year-old Connor Sparrowhawk and one-year-old William Mead. In 2013, Connor Sparrowhawk died in the care of Southern Health NHS Foundation Trust at Slade House in Oxford. The trust has accepted his death was "entirely preventable". Meanwhile, an NHS England report into the death of William Mead said he might have lived if 111 call handlers had realised the seriousness of his condition. William, from Cornwall, died of blood poisoning after a chest infection. Chris Hopson, chief executive of NHS Providers, which represents trusts in England, said it was "right" that patient safety was made a priority. "It is important this work is carried forward in the spirit of learning and sharing good practice, rather than recriminations," he said. Some avoidable deaths are deemed to have occurred among terminally-ill patients who might have lived longer if they had spent their final weeks at home - and Mr Hopson added too many patients were still dying in hospital. Announcing the roll-out, Health Secretary Jeremy Hunt said each trust was being asked to use the same methodology to determine whether a death was preventable or not. But he added the data released could not be used to rank trusts against each other because of different reporting procedures used when mistakes happened. He told BBC Radio 4's Today: "It's about hospitals creating a culture which makes it easy for staff on the frontline to say, 'look, something went wrong; I think it could have had a different outcome and we need to learn from this so it doesn't happen again'." Could the NHS save money by getting it right first time?